William Jennings was born in 1807 in Yeovil, the son of ironmonger, Postmaster and Portreeve of Yeovil, Robert Jennings. Early records for William are scant but in the 1841 census he was living with his widowed father and his Chard-born wife Jane, seven years his junior, and a servant in his father's ironmongery and Post Office in Silver Street. At this time William's occupation was listed as of independent means. In 1834 he was listed as a subscriber to William Hull’s “History of the Glove Trade”. In 1837 William Jennings, Gentleman, was listed in a House of Commons Private Bill concerning Railway Subscription Projects, as an investor in the 'South Western, or Kingsworthy & West Monkton Railway', subscribing £1,500 (about £160,000 at today's value using the 'historic opportunity cost' of an investment project). His father died in the summer of 1848 and William took over both the ironmongery business and the post office. He had three separate listings in Hunt & Co's Directory of 1850 - as an ironmonger, a plumber & glazier and as postmaster - in Silver Street. Slater's Directory of 1852 listed him twice; as an ironmonger and postmaster. It would appear that the post office side of the business took prominence over the ironmongery since in the 1851 census he described his occupation simply as postmaster and the Post Office Directories of both 1866 and 1872 only listed him as the postmaster. Daniel Vickery, writing in 1856, commented "There are three deliveries of letters, &c., every day, viz. : 8:15am , 11am and 6:30pm. The box for first north mail closes at 2 o'clock am; the box for London, Dorchester, and the East, at 5:30pm and for the second North and West of England, at 6pm. Letters are received with an additional stamp, 15 minutes later for North Mails, and 10 minutes later for London. Post-office orders are payable every day (except Sunday), from 10am to 4pm." The 1851 census listed him, Jane and their eight year-old son William, together with a servant at the 'Silver Street Post Office'. The entry in the 1861 census was all but identical. The 1871 census listed him once more as the Postmaster, together with Jane and their seven year-old grandson William, together with a servant, at Silver Street. In 1875, at the age of 68, William retired and the Yeovil Post Office transferred from Silver Street to Princes Street. William Jennings died in Yeovil in the spring of 1880, aged 72. 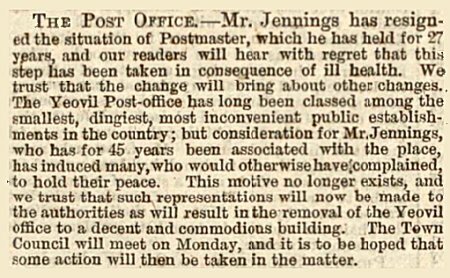 The notice of William Jennings' resignation as Post Master from the 29 January 1875 edition of the Western Gazette in which the Silver Street Post Office "long been classed among the smallest, dingiest, most inconvenient public establishments in the country." 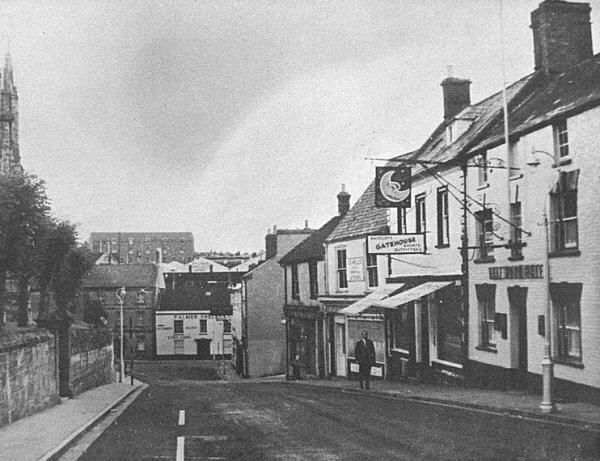 This photograph of about 1960 looks down Silver Street with the Half Moon Inn at extreme right with the building that housed William Jennings' ironmongery shop and Yeovil's second post office next door but one (next to the shop with the awnings).